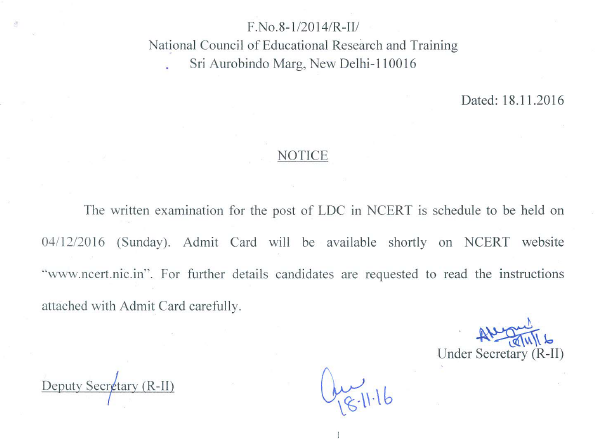 National Council of Educational Research and Training (NCERT) will organize Lower Division Clerk (LDC) examination on 04 December 2016. The exam date was announced through a latest notice released online at ncert.nic.in. NCERT LDC Admit card are available for download now at ciet.nic.in website and you can get them by entering your 10 digit registration no. and date of birth. NCERT is going to conduct written exam on 04 Dec 2016 for LDC posts. For that, admit card are available now. You can download NCERT LDC exam admit card from here via the official website ciet.nic.in. 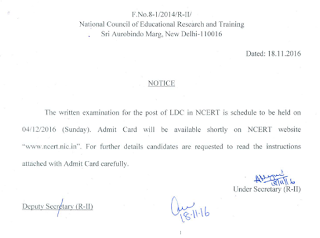 The written examination for the post of LDC in NCERT is scheduled on 04.12.2016. Admit cards should be download by each candidate who wish to appear for the exam. They are available at above link and can be downloaded by entering registration no. and dd/mm/yyyy.